Philip Rivers threw for 339 yards and two touchdowns and Caleb Sturgis kicked two field goals as the Los Angeles Chargers defeated the Oakland Raiders, 26-10, Sunday at StubHub Center. 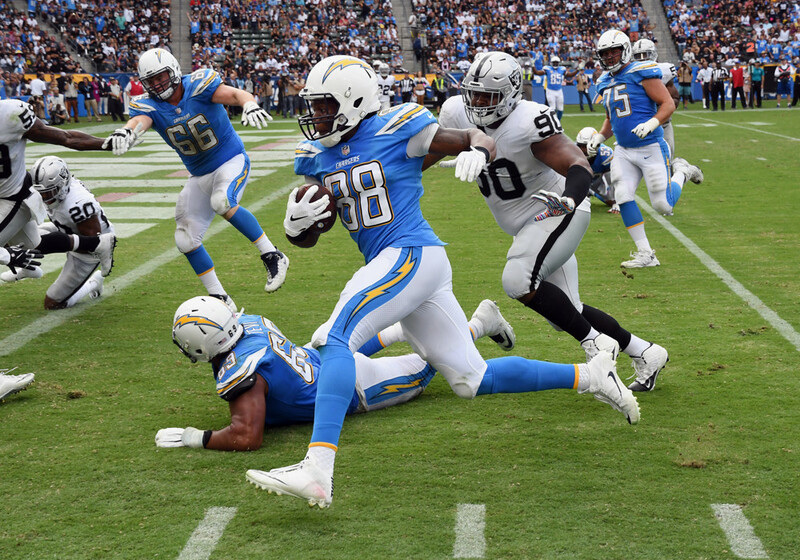 The Chargers outgained the Raiders, 412 yards to 289, led 19-14 in first downs and 34:40-25:20 in time of possession. “That’s a good team win,” Chargers coach Anthony Lynn said after his team won consecutive games for the first time this season, improving to 3-2. Oakland committed both of the game’s turnovers which the Chargers converted into touchdowns. On the first play after Rivers threw a 44-yard touchdown pass to running back Austin Ekeler four minutes, four seconds before halftime, receiver Martavis Bryant fumbled a 21-yard pass from Derek Carr which was recovered by Chargers safety Jahleel Addae at the Raiders 48-yard line. Melvin Gordon completed a six-play 48-yard touchdown drive with a 1- yard run, three plays after catching a 34-yard pass from Rivers. It was Gordon’s 21st rushing touchdown in his four-season career, giving him sole possession of seventh place in team history. Defensive end Melvin Ingram intercepted a Carr pass in the end zone late in the third quarter, the first regular-season interception of his seven-season career. The Chargers then drove 96 yards on eight plays, culminating with Rivers 13-yard touchdown pass to Virgil Green with 9:42 left. Rivers completed 22 of 27 passes for an 81.5 completion percentage, the eighth-best when he has at least 20 completions in his 15-season career. The 300-yard game was Rivers’ second of the season and 59th of his career. His 13 touchdown passes through five games matches his career high through five games, set in 2013. The Chargers converted seven of 13 third-down plays, 53.8 percent, Oakland four of 11, 36.3 percent. The Raiders were successful on the game’s only fourth down conversion attempt before a crowd announced at 25,362. Carr completed 24 of 33 passes for 268 yards and one touchdown with one interception. Carr threw a 1-yard pass to Jordy Nelson with 5:11 to play for Oakland’s lone touchdown. Matthew McCrane kicked a 49-yard field goal 1:37 into the second quarter for the only first-half points for the Raiders (1-4). Both of the Chargers usual starting offensive tackles — Joe Barksdale and Russell Okung — were sidelined by injuries. They were replaced by Trenton Scott, a rookie free agent from Grambling making his first NFL start, and Sam Tevi, a second-year player chosen in the sixth round of the 2017 draft from Utah, making his fourth consecutive start. The Chargers picked up two first downs on the opening drive, leading to Sturgis’ 49-yard field goal, the only score in the first quarter. Sturgis kicked a 30-yard field goal for the third quarter’s only points, increasing the Chargers lead to 20-3. Sturgis missed a 48-yard field goal attempt on the final play of the first half. Sturgis’ extra point kick following Green’s touchdown hit the left upright. “The extra point did bother me a little bit, but we’ll figure out what happened there,” Lynn said. Sturgis made the extra point kicks after the Chargers first two touchdowns. Sturgis missed two extra points and a 54-yard field goal attempt in last Sunday’s 29-27 victory over the San Francisco 49ers, prompting the Chargers to cut his holder, Drew Kaser, and sign fellow punter Donnie Jones, Sturgis’ holder with the Philadelphia Eagles for 30 games from 2015 through the 2017 season opener. The Chargers drove to Oakland’s 5-yard line with 2:00 to play, but Rivers took a knee on each of the game’s final three plays.